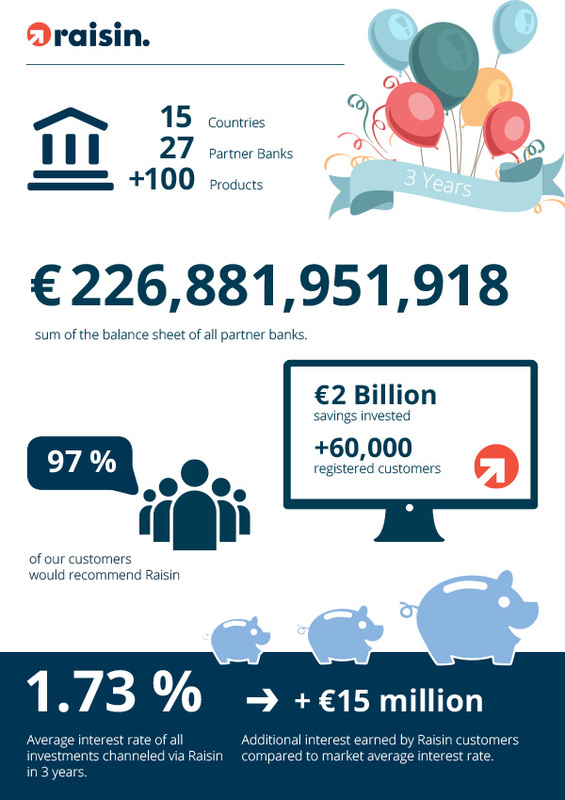 Berlin, January 10th, 2017 – Raisin proudly announces that at the end of 2016 it did not only celebrate the 3-year anniversary of its launch in Germany but also reached a milestone of EUR 2 billion in invested volume. In the three years since the launch in Germany Raisin customers have earned more than EUR 15 million additional interest compared to what they would have earned if they had invested at average interest rates. Thus providing Raisin customers with a significant upside in today’s dire low interest rate environment. For 2017, Raisin plans to continue to provide savers across Europe with attractive and exclusive offers for their savings and to broaden its reach by offering localised platforms for additional markets, further broadening its partner bank offering and entering distribution partnerships with banks across Europe. Under the brand WeltSparen, Raisin GmbH has offered an online marketplace for deposit products of partner banks in the European Economic Area since 2013. The Raisin platform is now available across Europe in English and localised platforms exist for Germany, France, Spain, and Austria. Raisin gives customers the possibility to open deposits at attractive interest rates across Europe free of charge. Previously, customers had to contend with varying, complex account opening procedures in foreign languages, sometimes requiring physical presence in the country. These are no longer a concern with Raisin.